Arms, ammunition and other items recovered from the NSCN-K linkman. Image: Northeast Now. A joint team of Army and Assam Police apprehended a linkman of Naga rebel group, NSCN-K from Tipong Township under Lekhapani police station of Tinsukia during a search operation on Friday night. 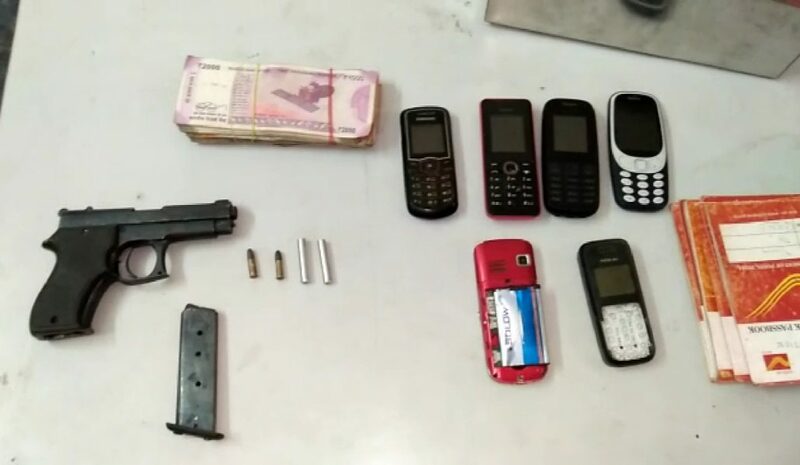 The joint team of Army and police recovered one .22 pistol with two rounds of live ammunition, seven mobile phone handsets, Rs 45,490 in cash from the apprehended person identified as Buddheswar Bora (52). He was handed over to Lekhapani Police Station on Saturday. However, the family members of the apprehended person claimed that Buddheswar was an innocent person with no links with insurgents. They said Buddheswar earned his living by carrying and delivering LPG cylinders in his auto van. It may be mentioned that local people have accused the Army of picking up innocent persons from areas like Jagun, Lekhapani etc., along Assam-Arunachal Pradesh boundary of late in the name of geared up operation against insurgents.